SOUTH BEND, Ind. (AP) — Manson Adam Davis never stopped telling his story. It’s been nearly 60 years since he said he was kicked out of high school just two weeks before graduation. As Davis remembers it, his class was getting ready for a party and a teacher walked straight to the high school senior’s desk, reached inside and produced a bottle of peppermint schnapps liqueur. To this day, Davis swears it wasn’t his. The teacher, Davis recalls, told him to leave Washington High School and never come back. It was 1960 in South Bend. Davis is black; the teacher, white, and, for many of those who’ve heard the story over the years, it was hard not to believe that the severity of the punishment — denying a high school athlete his diploma just weeks away from graduation — was racially motivated. Officially, Davis has been listed in the records of the South Bend school system as a student who dropped out of high school and never earned a diploma. Unofficially, his story seemed to many like an example of a racially motivated injustice. But after decades of sharing of his story, the system has reversed course and Davis received something he hasn’t dreamed would be possible: a diploma. The overdue diploma Davis finally received — which officials have called “honorary” — is far from typical. A motion to approve it noted he was scheduled to graduate in June 1960. It describes how he served in the Air Force and was an active member of Greater Friendship Missionary Baptist Church. That admission by district officials may be overdue and bittersweet for some of Davis’ supporters. But School Bend Community Schools Corporation board member Dawn Jones, who played an instrumental role in helping Davis receive the diploma, felt it was an essential step toward righting a wrong. She said giving Davis a diploma was more than just a routine measure — it was about the district “correcting things” and taking stock and asking whether or not race affects the expulsion of future graduates. Although Davis maintains the alcohol found in his desk decades ago did not belong to him, he and his family didn’t challenge the district’s decision. After a stint in the Air Force, Davis went to welding school and held jobs at Studebaker, Allis-Chalmers and AM General. His father, who was once the pastor of Greater Friendship Missionary Baptist Church, gave each of his children a suit for high school graduation. Davis was the only one who never got one. Clara Davis was the one who made sure her husband’s high school senior portrait sits in the front living room of their Sheridan Street home — like a lone candle burning in a window. Now the diploma will sit right next to it. Davis said he hopes people know his story and take from it a lesson of some sorts: If you’ve been wronged, just keep telling people until you find someone who can do something. 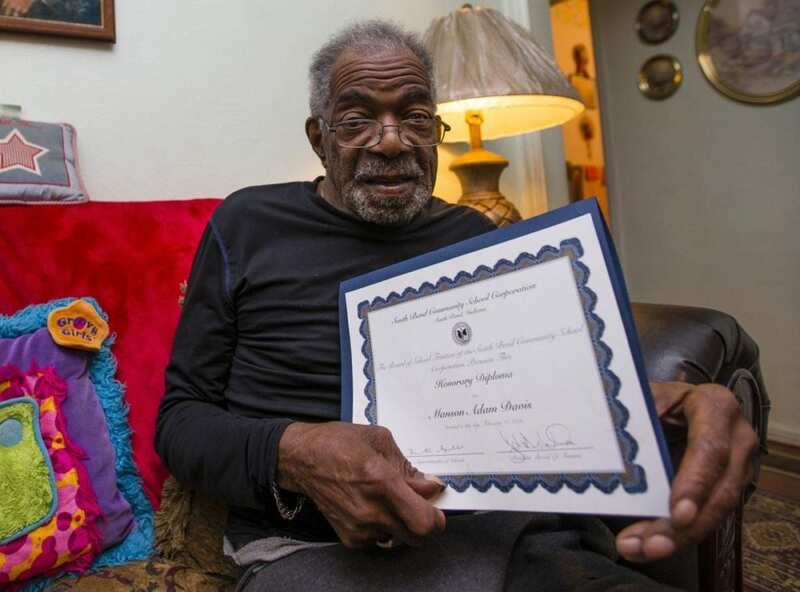 Be the first to comment on "Indiana Man Finally Gets Diploma, 6 Decades After Injustice"